How many times have you heard someone say “It flies by so quickly”… “Zip, the day’s gone”… “I can’t believe how fast it went!”? Sounds all a tad familiar? After all the planning, time and effort, there is no doubt that your big and beautiful day is sure to be the highlight of everybody’s diaries! It’ll be looked forward to months in advance and then reminisced about for months to come! Unfortunately, sometimes you can jump from being that organised, busy as a bee, blushing bride-or-groom-to-be, to having the ring on the finger and signing on that dotted line in the blink of an eye! It does seem a bit of a shame to cram all the emotions and joys into one day alone, and whilst no other day will beat the ‘big day’, we’re the biggest fans of finding ways to prolong the party. 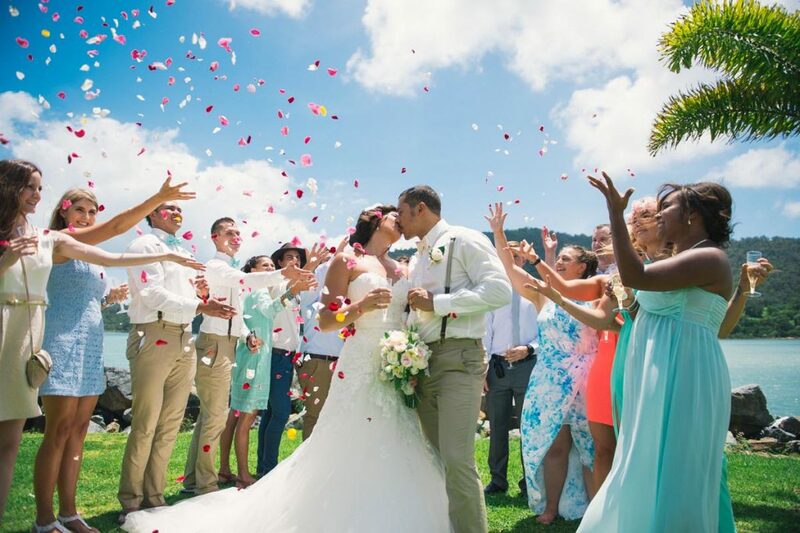 With all your guests travelling from near and far to witness you marry in a destination wedding location, it makes for the perfect excuse to extend your “one-day affair” into a wedding-weekend, or wedding-week, of celebrations! It gives you time to soak up your surroundings with your loved ones, with your wedding day itself acting as the Main Event: Perfect! 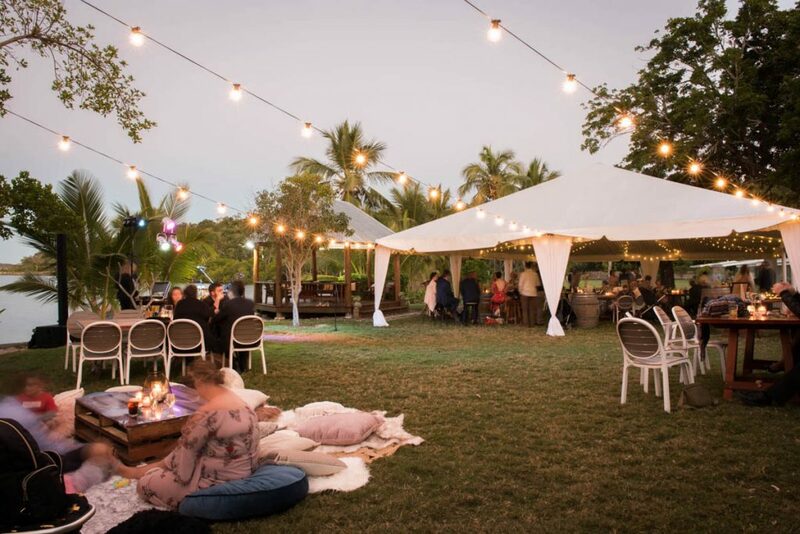 With this in mind, the Whitsundays ticks all the boxes with ample opportunities for wonderful memory-making moments to share with your guests long after the “I do’s” have taken place. 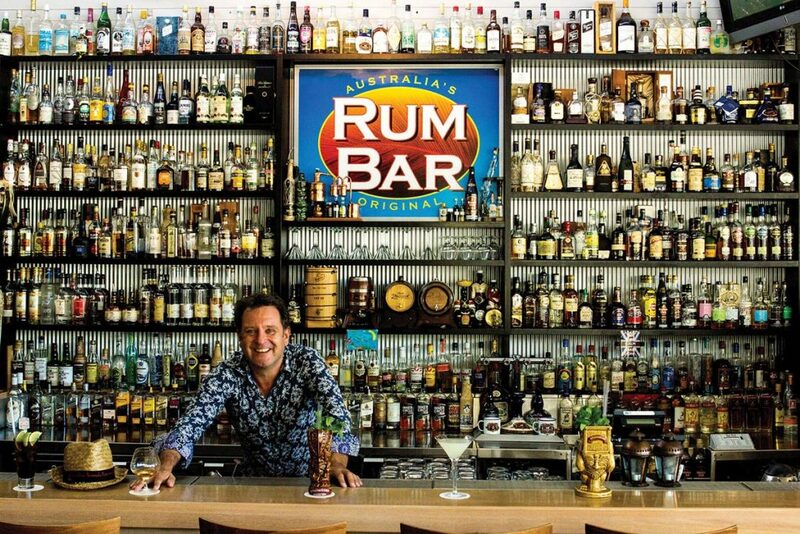 You can’t come to the Whitsundays without catching that sailing buzz. Stepping on board Lady Enid, you step back in time where this rare and classic heritage yacht boasts elegance, sophistication and that old world charm. Sometimes it’s not just about the destination, but the journey itself. Become as involved as you’d like, help set the sails, take a turn on the helm, or simply lean back, indulge yourself and soak up the uninterrupted beauty of the islands as you glide your way to Whitehaven Beach. Book onto Lady Enid for a day tour or organise a private charter for up to 24 of your wedding guests and explore the pristine coast line with attentive crew, gourmet meals and make some beautiful memories. This is barefoot luxury at its best. If you’re searching for something with a little more ‘wow’, then not much else competes with an exhilarating and thrilling day on the water with Ocean Rafting. Ride the waves, chill on Whitehaven Beach, snorkel with Nemo and his friends and soak up the scenery as you speed around the islands. 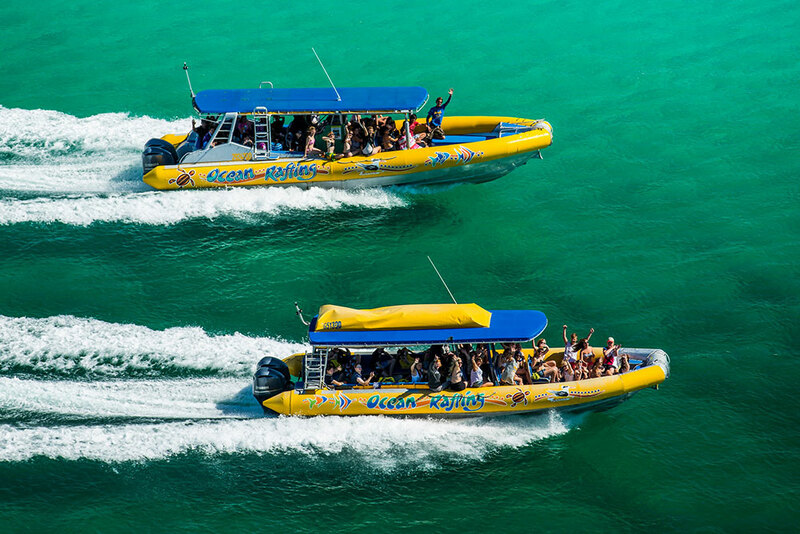 This multi award winning operator boasts some of the fastest boats in the Whitsundays, so you are in for a fun ride and a bit of adventure, whilst also allowing you to explore some of the most incredible locations all in the one day. They are also the only tour operator with direct access to the stunning swirling sands of Hill Inlet at Whitehaven Beach, as well as being able to get you up close and personal with the brimming marine life at some special snorkel sites. You can choose to book into regular tours with your guests, or for a more customised experience you can privately charter one or more of their vessels. Feel like you’re re-writing history by sailing on board one of Australia’s most famous Tallships and experience in the magic of whisking through the waters on a hand-crafted and traditional vessel. Derwent Hunter combines perfectly the romance of history, with the thrill of traditional sailing! 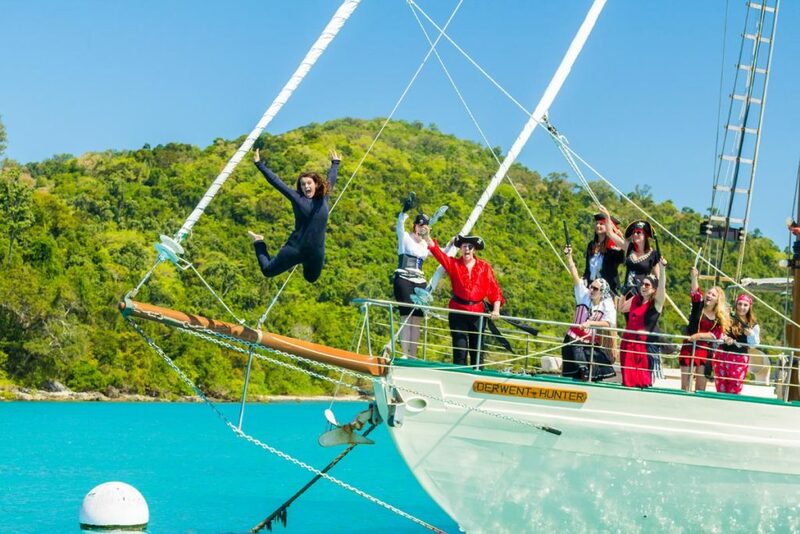 It ticks the boxes perfectly for those guests wanting it all: Sailing, snorkelling, relaxing, comfortable cruising but still with that spirit of adventure! With large stable decks and plenty of shade, Derwent is the perfect sailing ship for all ages, so you can be sure your weddings guests, from the young’uns to the grandparents, will enjoy the day exploring a slice of paradise no matter their age or abilities. There’s nothing quite like watching the sun go down and looking back at the twinkling lights of Airlie Beach from the water, with a glass of wine in hand and surrounding by your nearest and dearest. Sundowner Cruise’s custom built vessel was designed with convenience in mind, built with a spacious, open plan and completely flat entertaining area, it’s all about the socialising. With a fully licensed bar on board and a friendly, sociable atmosphere, it is the perfect opportunity to get out on the water and soak up the scenery with up to 48 of your wedding guests without having to go out for a full day tour. 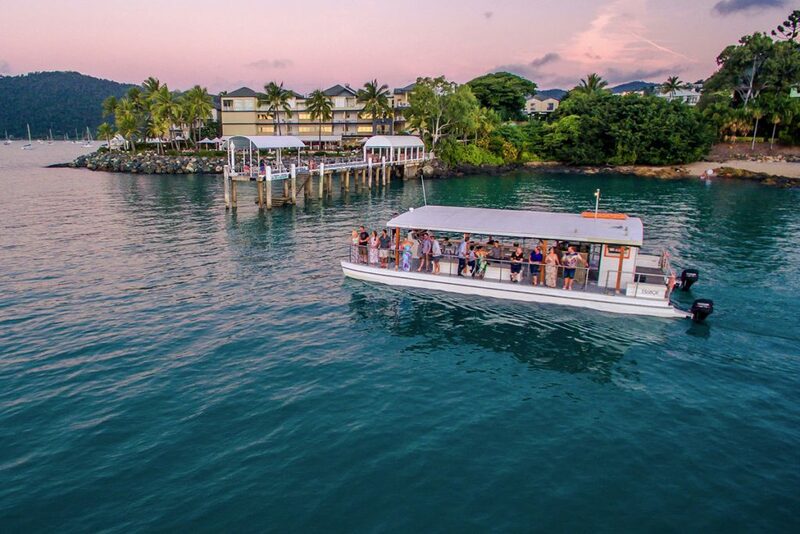 We recommend pairing this sunset cruise with a beautiful dinner afterwards – Tides Restaurant at Peppers Airlie Beach is just a short taxi ride from the marina and the perfect place to end the night with good food and your company after your cruise around the bay. These comfortable and convenient modern vessels are the perfect choice for all the family. Cruise Whitsundays will take you to the top spots with speed and ease, including Whitehaven Beach, Hamilton Island, and of course (right on the top of the bucket list), the breath-taking Reefworld located at Hardy Reef – home to the world famous Heart Reef. See the spectacular Great Barrier Reef and enjoy the interactive pontoon where you get to spend a day exploring the wonders of the underwater world brimming with marine life and colourful corals. Whether you want to take your wedding guests for a scuba dive, a snorkel safari, grab a Seabob and go for an adventure, or simply want to watch the magnificence from the underwater viewing chamber or soak up the views and sunshine from the top deck – You are certain to please every single one of your guests with something for each of them to enjoy and end your wedding week on a high! If there’s one thing that’s a little bit different but certainly a ‘must do’, encourage your wedding guests to join you for a day out fishing to the Whitsunday Islands and Great Barrier Reef. 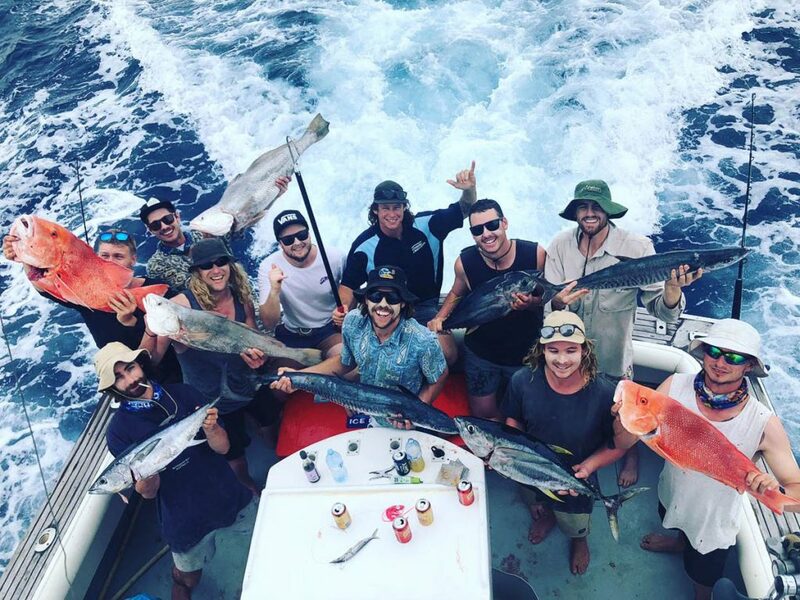 Whether you’re an avid fisherman with plenty of experience, or it’s your first time throwing a line, the knowledgable crew at Whitsunday Fishing Charters will guide you and assist so you can give it a go catching your dinner. The comfortable and quick vessels speed you around the islands to some of the best fishing grounds in the Whitsundays, spending some quality time with your guests. Once back from your adventures, why not have your freshly caught fish cooked up that day at Fish D’Vine (and leave them to do the dishes! ): What a perfect way to finish off your day fishing in paradise! We can’t mention Fish D’Vine without mentioning Mojitos! Whether you make this a scheduled visit and invite the whole wedding guest list, or simply pop by for a night cap after a day in the sun, Fish D’Vine and Rum Bar is a must-do to end the wedding week festivities! Enjoy locally caught seafood cooked to perfection, go on a ‘Rum Journey’ (start with their award-winning mojito and see where the night takes you), and even enjoy their private courtyard so your wedding guests can come and go as they please, making it a perfect meeting point for a relaxing, enjoyable and indulgent evening to round up the joys of the week.